August 1932: … as part of the research for his Marlborough biography, Churchill left England for Germany, and for a visit to the battlefields of Blenheim. With him on this expedition went Clementine, Sarah, Randolph, Prof [Lindemann], and a leading military historian, Lieutenant-Colonel Packenham-Walsh. After visiting Marlborough’s early battle triumphs, Ramilles and Oudenarde – in Belgium and Holland – the party drove on to Munich, before proceeding southwards to Blenheim. 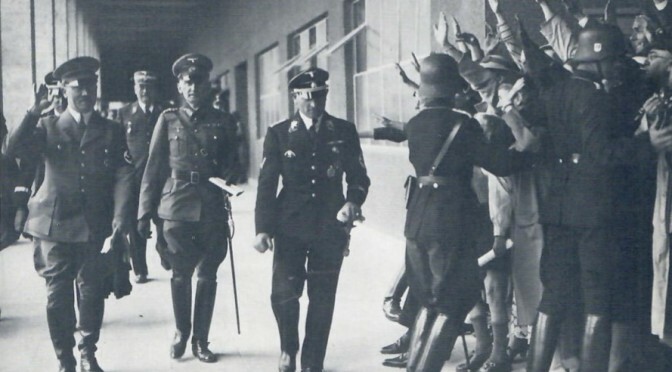 While they were in Munich, Randolph was keen to set up a meeting between his father and Hitler. While reporting the election in July, Randolph had met, and enjoyed the company of one of Hitler’s friends, Ernst Hanfstaengel, a Harvard graduate., and a friend of the then Governor of New York State, Franklin Roosevelt. Randolph now asked “Putzi”, as Hanfstaengel was known, to use his influence to bring Churchill and Hitler together. Churchill dined with Hanfstaengel who spoke in a bewitched manner about Hitler and his policies. It soon emerged that almost every day Hitler visited the very hotel in which Churchill was staying. Hanfstaengel was therefore certain that a meeting could easily be arranged. Although Churchill gave Hanfstaengel his permission to arrange the meeting, Hitler was not keen. He was indeed quite nervous of the prospect, dismissing Churchill, according to Hanfstaengel’s own account, as a “rabid Francophile”. Hitler never appeared for coffee. Hanfstaengel made one more effort the next day to persuade him to meet Churchill. Refusing yet again, Hitler asked what could be achieved by meeting a man who was not a member of the Government and to whom no one listened. “People say the same thing of you,” Hanfstaengel replied. Alternating his routine, Hitler avoided the hotel during the remaining two days of the Churchill’s visit.